Uglyworld #147 - Big Jeero Found It Harder To Say Hello, originally uploaded by www.bazpics.com. Once it seemed that all the little uglies questions had been answered Wage told them all to close their eyes and count to 10 as he had a surprise for them. 1...2...3..4....5...6....7..8....9...10 - and opened their eyes. Screams echoed around the room as they old started running off in different directions with their arms being thrown around like crazy. Big Babo didn't know what to say to it all, he only wanted to say hello to everyone and let them ask him questions like they had done to Wage previously. 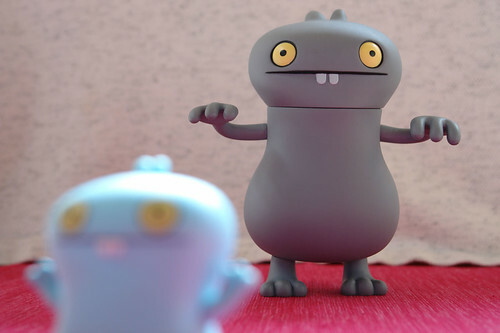 Little Babo almost ran right into my camera as he was in such a panic to get away.